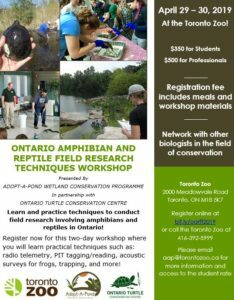 Learn and practice techniques to conduct field research involving amphibians and reptiles in Ontario! This is your chance to network with other biologists while learning the skills necessary to survey for herpetofauna. Register now for this two-day workshop where you will learn practical techniques such as: radio telemetry, PIT tagging/reading, acoustic surveys for frogs, trapping, and more! 100% of the proceeds generated from this workshop will go into reptile and amphibian conservation.